Kinda off topic but how likely is it and if so in which proportion that Germanic groups are a mixture of Corded Ware and Bell Beaker groups, and where would I1 fit into this? Pangermanists want to tie themselves to all cultures and people possible. I fail to see how can CWC be ancestral to both Balto-Slavs, Indo-Iranics(both groups are related by genes and language) and Germanics, which are totally unrelated to both. The Germanic R1a-Z284 is part of the R1a-Z282 clade, same as Balto-Slavic R1a-Z280 and Slavic R1a-M458. Indo-Iranian R1a-Z93 is a parallel clade to R1a-Z282. Baltic_IA sample is dated to 2nd-5th centuries, so I'd hold your horses on him being Finnic. From what I can tell the line between Balts and Estonians is very murky what seems to separates them is few percent of "Siberian" admixture, and the Tarand Graves leaks judging from PCA don't seem very different from the current Baltic populations. My guess since I'm no expert in this that NW Russia from around St.Petersburg south towards Moscow wasn't very different, knowing that there were Iron age Finnic and Baltic cultures there,who imo largely formed on CWC substrate. Hence the shared the high degree of similarity. But anyway that's just my guess. Baltic_IA sample is dated to 2nd-5th centuries, so I'd hold your horses on him being Finnic. I have no idea what language he spoke, especially since he was dug up in Lithuania. He may have spoken some early dialect of Balto-Slavic. But that's not the point. The point is that he's a good proxy for the non-Saami input in Finns, so he's likely to be similar to Finnics or Proto-Finnics at some level. In fact, I think you'll see that he will turn out to be very similar to the N1c-rich samples from the Estonian Tarand graves. 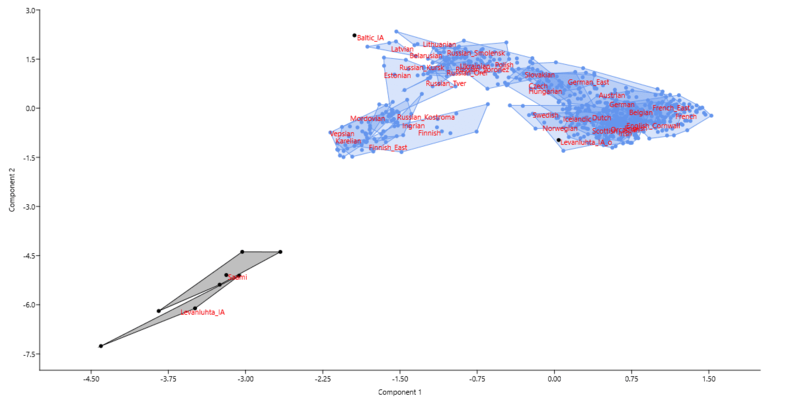 These samples, as well as Baltic_IA, differ fundamentally from Corded Ware in that they show excess Northeast European forager ancestry, as well as probably some Siberian admixture. I don't know what this means exactly, but for now I'm guessing that the Proto-Uralics who came to Northeast Europe passed on their language and paternal ancestry to locals rich in local forager ancestry, and that's how the Proto-Finnics came to be. > Corded Ware in that they show excess Northeast European forager ancestry, as well as probably some Siberian admixture. Yes, what I meant to say that still the highest share of overall ancestry is still from CWC like source, minus the later input of HG's, farmers and the Siberian ancestry. I mean how different are Baltic_BA samples like Turlojiske who are all R1a compared from Baltic_IA who's N1c? Is there anything that sets them apart? I mean how different are Baltic_BA samples like Turlojiske who are all R1a compared from Baltic_IA who's N1c? Is there anything that sets them apart? Compared to Corded Ware, Baltic_BA shows more local forager ancestry and a specific signal of Baltic genetic drift. Baltic_IA is like a more extreme version of Baltic_BA, but, as far as I can see, also with some extra affinity to Finnics. There's also an Iron Age genome from Valkeakoski Finland coming out soon. According to an interview the researcher gave the Finnish newspaper Helsingin Sanomat, he belonged to N1c, more specifically the Savonian-Karelian CTS1737 subclade. Genome wide it was said that he was closest to Baltic HGs and not at all the Sami, which I guess means he lacked much of the Siberian related ancestry found in Finland today. The article is behind a paywall sadly. It's not that surprising, because during the Bronze and Iron Ages the early Uralic speakers would've been moving west across the forests of Northeastern Europe, and at that time there would've still been some largely unadmixed forager populations living there. Levanluhta_IA being modeled by BOO and Levanluhta_IA_o alone would suggest that BOO is not some sort of Pre-Uralic but is instead (Pre)Proto-Saami who spread with Lovozero Ware (1900-700BC) and came into contact with costal Germanic speakers. No need for a second Saamic migration. Like mentioned on the other post it seems like BOO is a mix of two populations with the BOO006 outlier. Also on Anthrogenica Shaikorth showed Mordovians take Hun_Tian_Shan over Bolshoy_Oleni_Ostrov which is not the case for East Finns. An amateur on Anthrogenica posted an admixture run with samples from Oleni Ostrov, Čalmn-Varre, Leväluhta, Botai, Latvia HG, several Latvian and Estonian ancient samples and some modern samples. In his run Leväluhta samples form several different clusters. In this admixture run, only two Leväluhta samples are close to a modern Saami sample and Čalmn-Varre samples that were Saami speakers with 99% certainty. The outlier and two other samples align with BA Kivutkalns samples and BA Turlojiske samples. Leväluhta JK1968 sample with a mtDNA typical of Uralic populations around the Urals (U5a1a1a'b) comes out as Kunda Donkalnis and Narva Kretuonas samples with excess hg ancestry. The yDNA N bearing IA sample from Lithuania aligns with BA Kivutkalns samples and BA Turlojiske samples although they form their different cluster compared to previously mentioned BA Kivutkalns samples and BA Turlojiske samples. It is worth mentioning that this ‘blue’ component appears also in the modern Saami sample, Čalmn-Varre samples as well as in two Leväluhta samples. This component could form part of the Western Uralic ancestry. The problem is, non-Bolshoy part of Saami is hard to model with just Northwest European-like ancestry which is what the Levanluhta outlier represents. G25 will demonstrate this well (Baltic_IA works but is suboptimal because pre-Saamis were never in the Baltics). A better solution will be available soonish, likely next year. Those models with modern day Volga Uralic peoples look great. Now we need ancient forest Volga and Kama samples to corroborate. Iberian Neolithic drift in G25 PCA is not recent. It formed in ancient Anatolia before farmers arrived in Iberia. One early Neolithic Iberian farmer is set apart from all other Euro farmers. He has this drift as well as much less IranNeo & Natufian-related ancestry. Iberian farmers have ancestry from people like him, people like normal European farmers (which includes IranNeo & Natufian-like ancestry), and Iberian hunter gatherer admix. IMO, a unique stream of Anatolian ancestry is why Iberian farmers have unique mtDNA. mHG H1, H3, K1a4a, K1b1a1 probably originated in these yet unsampled Anatolians. which do not appear in Leväluhta samples or in Leväluhta outlier. The percentage of Leväluhta outlier-like ancestry in Finns is c. 10% and in Saamis a little bit less than that. Chalmny-Varre sample is in fact surprisingly different from modern Saamis. Some of those clusters in that analysis are largely defined by similarly low counts of markers and/or high levels of ancient DNA damage. As Davidski said, low SNP count is messing with that run. One of the Kivutkalns samples is 100% in the Sidelkino cluster there and that would have been noticed long ago in other tests. Yes, but in spite of this, the western Uralic samples probably turn out to have excess EHG and Latvia HG compared to Leväluhta outlier and Bolshoy. We will see soon. How much R1 do Saami have and what subclades do they show? Curious because that can give us a clue about their non-Siberian ancestry and plus I strongly doubt they have any significant Indo-Iranian ancestry like some people have tried to suggest. Apart from N1c, Saami mostly carry the Germanic I1, R1a-Z284 and R1b-M269. They probably have some Baltic R1a-Z280 as well, because Finns do. But I don't know of any cases of R1a-Z93 in Saami or Finns. So they don't share any paternal ancestry with Indo-Iranians or even the Corded Ware people who became Indo-Iranians, except obviously what was mediated via their Germanic R1a-Z284 lines. The fact they have significant I1, R1b and R1a-Z284 to me is evidence that populations like Levanluhta_IA_o and not just Baltic_IA were significantly ancestral to Saami, so Germanic ancestry is the only thing that can explain at least a huge part of IE ancestry in Saami. That and the linguistic contacts between Germanic and Uralic why I find it hard to believe Mezhovskaya or even Baltic_IA were the most or even only significant contributors of IE ancestry in Saami or that Germanic fits must be wrong, unless a non-Germanic IE population had all of these particular haplogroups, the probability of which is 0. The western ancestry in Levanluhta_IA is largely of Germanic origin. No doubt about that. Present-day Saami are similar, but they might have more Baltic_IA type of ancestry because of recent contacts with Finns. In any case, the people claiming that Saami are in any significant way of Sintashta, Mezhovskaya and/or Indo-Iranian origin are talking out of their behinds, but this actually happens a lot in these sorts of discussions. Some people just lose most of their IQ points all of a sudden and talk crap. What do you know of mtDNA H20 in Iberia? YDNA is not so important from the autosomal point of view. YDNA changes easily, is subject to drift and elimination. In his article ”An essay on Saami ethnolinguistic prehistory”, Ante Aikio has identified a Palaeo-Laplandic substrate in the Saami language that is missing in Finnish. We know that the Saami burial in Kola Peninsula Chalmny-Varre yielded a male with yDNA I2a1 and mtDNA V7a1 and a female with mtDNA U5b1b1a3. V and U5b1b1a3 cover 80-95% of the mtDNA of modern saamis. IMO, the paleo-Laplandic substrate is probably related to I2a2, and this means that there is also a Palaeo-Scandinavian genetic substrate in Saamis that is different from Bolshoy. No mtDNA V or U5b was found in Bolshoy. V and U5b haplotypes are particularly frequent in Saamis and Finns and also found in some Uralic populations. Considering the ancient autosomal DNA, formal statistics models, Saami Y-haplogroup data and pre-ancient DNA conclusions based on linguistics data, your comment sounds like special pleading. There is an infinite amount of possible modellings. If U5b1b1a is found in Uralic(s) in Russia & Siberia that would be important. I haven't looked at mtDNA in a while. But I do know, H20a1a is unique to Iberia. The oldest of H20a1a example is from Neolithic Spain and dates to 4100 BC. H20a1a is defined by the 16362c mutation. H20a is non-existent in Europe (outside of Iberia). It exists in every part of SW Asia (except Iran) from the Caucasus to Egypt. To my knowledge, U5b1b1a (16144C) is found in smaller amounts also in Mordvins, Maris, Komis, Bashkirs, Chuvashes, Lipka Tatars, Yakuts and Buryats. The oldest U5b1b1a to date is from Narva in Lithuania, Kretuonas4, c. 4400 BC. It has not been found in any presumed IE samples. Interesting. Are there any other haplogroups that are or seem to be unique to Iberia that you know of? There is no reason to think Saami are significantly remnants of an ancient European hunter-gatherer population. The EEF/CHG ancestry in them is just too high to justify that idea. The Narva sample is U5b1b1*. The authors misreported it as U5b1b1a which is annoying. When the mtDNA was published it showed no 16144c mutation. There's also a U5b1b1* in Mesolithic Poland. U5b1b1* is present throughout Europe today but especially in eastern Europe. Ok, then U5b1b1a must be a Uralic lineage in Saami. "Interesting. Are there any other haplogroups that are or seem to be unique to Iberia that you know of?" There's many. I'll post about mtDNA again sometime. @Anthony Haken BOO and 1900-700BC are way too early for (Pre)Proto-Saami, see . Maybe some non/para-Uralic substrate, I don't know. The spread of Saamic languages is relatively recent, likely from the Lakeland northwards. Ánte, L. S. S. (2012). An essay on Saami ethnolinguistic prehistory. A Linguistic Map of Prehistoric Northern Europe. Mémoires de la Société Finno-Ougrienne, 266, 63-117. "Apart from N1c, Saami mostly carry the Germanic I1, R1a-Z284 and R1b-M269. They probably have some Baltic R1a-Z280 as well, because Finns do." That is right. It is also likely that that Saamis carry new Siberian-Fennoscandinavian admixtures apart from BA, IA, Baltic Finns etc. Therefor only isolated admixture proportions, like Nganasans, EHG and WHG works well enough to map them. Nganasans work so well in models for Uralic populations probably because they have some EHG, but not too much. Despite of what someone at your blog said, Bolshoy can't explain the eastern ancestry in Levanluhta_IA/Saami very well, probably because its EHG ratio is way off. But one of the Bolshoy samples, the female outlier BOO006 does seem to have the right ratio of EHG, because she can be used successfully instead of the Nganasans. So it's an interesting question what BOO006 represents and whether such a population already existed within Europe's borders when she was alive. IMHO these are the sorts of details you should be investigating at your blog. "Maybe some non/para-Uralic substrate, I don't know. The spread of Saamic languages is relatively recent, likely from the Lakeland northwards"
Check out page 81 for what I was reffering to about the Saami. This of course only works if Levanlhuta can be modeled well by BOO and Germanic alone. There's no mystery as to Uralic. The equations are simple: language from the west, genes from the east. People are racking their brains trying to makes both go to one of either direction. From a historical perspective, this usually happens when a subservient group suddenly gains dominance after having adopted the language of their former leaders. An EHG related group is the most likely candidate of the original pre-Proto-Uralic speakers. "Additionally, the nearest counterparts of Vardøy ceramics, appearing in the area around 1,600-1,300 BCE, can be found on the Taymyr peninsula, much further to the East. Finally, the Imiyakhtakhskaya culture" from Yakutia spread to the Kola Peninsula during the same period." "There is an infinite amount of possible modellings. To get a more balanced view, you should take into account M. Myllylä's post: http://terheninenmaa.blogspot.com/2018/12/finnish-and-north-russian-ancestries.html#comment-form"
We have two point of views here, in one we can explain more recent populations by using EHG, WHG, CHG, ENA and early farmers. This helps us to map a large number of populations over Eurasian in a way we can compare results, but of cource that kind of results don't explain the whole history. Already Bronze Age populations were more mixed and present-day populations are mixtures of Bronze Age and Iron Age populations. In a best practice we should use contemporary popelations as admixtures, but for more practical reason it is not possible. Anyway, if the time frame between used admixture populations is big we have risk to fail, because same admixtures are hidden. I wonder what they mean by these arrows from Poland and Siberia? Balto-Slavic Corded Ware and Uralic Siberian HG? I hope they don’t follow Carlos theory. It seems to me that Lamnidis et al. didn't notice how extremely Germanic Levanluhta_IA_o was. And also that Levanluhta_IA was significantly Germanic. “It seems to me that Lamnidis et al. didn't notice how extremely Germanic Levanluhta_IA_o was. That’s why I wondered why on Max Planc’s map they put an arrow from Poland and not from Sweden. There's no mystery as to Uralic. The equations are simple: language from the west, genes from the east. An EHG related group is the most likely candidate of the original pre-Proto-Uralic speakers. Not as far as Saamis and Baltic Finns are concerned. For them it's language from the east, a lot of the genes from the west, and some from the far east. Take a look at the mixture models in Lamnidis et al. and also my analyses above. EHG doesn't explain anything for Uralic. I wouldn’t be surprised if Max Planck adopted Carlos’ theories about CWC being Uralic. If anything they’re contrarian at best and extremely biased at worst; it’s almost like they get their researchers off a mental ward. At this point they should stop trying. Uralic genetics seem pretty interesting here. Funny how those at Molgen (the english version) seem like the biggest contrarians, talking without ancient DNA, basing Y-chromosomes according to present locations, and not using qpAdm or qpGraph. First, they claimed R1b to be native to W Europe, then trying to tie R1b and R1a to WHG, then trying to tie whole R (and whole Q as well) to WHG, by using inexact models trying to show WHG in Mal'ta (which recent models discarded, apart from the CHG-like component in ANE), then claiming ANE arised in Central Europe, then trying to use F*, K* and P1* to try to put a Western European origin for the R-Q clade, while unaware that the former two are widely distributed across Eurasia and North Africa, that the latter came from historical invasions from Central Asia, and that P1*, P*, M, S, N, O, K2c, K2d, K2e and K2* are all associated with ENA/East Eurasian populations, or at least ENA-admixed. In addition to still supporting the Anatolian hypothesis even though ancient and modern DNA killed it. And also seriously claiming that N1c originated in NE Europe, even though N1c is observed earlier in Siberia, presumably marking Proto-Uralics, and that N came from Southern China. I also saw no mention of Yana RHS yet. Anyways, this is severely out of topic. I'm basically serving as the thread information gatherer of the blog. Please note that I generally discourage discussing Carlos and his theories at this blog. Wonder where went all those people with CT* and BT*. CT* appeared in UP Europe, Natufians and EEF (among others), yet no living person has been found with it yet. BT* appeared in Vestonice (specifically Vestonice 15) and two times in ancient East Africa, yet no living person has been found with it yet either. As for eastern ancestry, has Baikal_HG been tested as proxy? Glazkovo_EBA is practically the same thing as Baikal_HG. The results of the Tarand Grave samples might "bring back" some CWC=Uralic theory but only at an amateur level which it has never left in the first place, not in academic papers. Besides them having N1c1 CWC lacks the cultural correlate will be Tarand <- Dyakovo <- Textile Ware <- Volosovo, not CWC. The origin theory they're going to present will reflect that. Considering both BOO men are N-L1026 I would bet they carry a decent amout of whatever admixture PU speakers carried. The problem is BOO is seemingly a mix of two respectively eastern and western populations. As far as I know until we have more aDNA we can't know which part of BOO was Uralic. That being said it seems like what happened in Finland is becoming more clear. Here are a couple more models for Levanluhta_IA this time using the Bronze Age samples from the Mongolian steppe. Hovsgol_BA_o1 is the extremely Siberian-like outlier, while Hovsgol_BA_o2 is the half Steppe_MLBA one. Would it be possible to run qpAdm to estimate the amount of ANE or EHG in Nganasans? I guess Shamanka Neolithic or Devil's Gate would suffice to model the East Asian ancestry. Since Nganasans are the closest thing we've got to the Siberian component in Uralics, it'd be nice to know what they're actually made of. None of those are CT*(xC, D, E, F) or BT*(xB, CT), they are just low coverage so the downstream haplogroup cannot be identified. You have to look carefully at what hgs have actually been excluded. According to genetiker the Malawian BT*s are B2b and the Natufian CT* is E, which is exactly what you'd expect. Not sure what to make of that. I might look at this issue in more detail soon and write something up. What your chart shows is Saami as representatives of Iron Age Nganasan-like people coming westwards along the Artic coast. In contrast, the Finno-Ugric are descendants of the older Mesolithic Karelian group that were EHG rich (R1a), with very little Eastern genetic contribution except perhaps a some females. This is an indication that (proto) Uralic was present in this region prior to any major entry of Nganasan/Easterners (ydna N carriers). This is further strengthened by the fact that Uralic is found as a substrate in Germanic, although a relatively faint one which suggests a very ancient presence. Between the Baltic Sea and the Urals during the Mesolithic existed the Kunda culture. They would best represent a group that spoke an ancestor language to Uralic. To their south Proto-IE was developing, and eventually reached north by way of Iranic which influenced Uralic directly. If Uralic was coming directly from the east we would see at least a faint trail of Uralic substrates instead of a sprachbund with northeast Asian languages. Uralic terminates in the east with the Nganasan proper. Their genetic brothers to the east speak completely unrelated languages while those to their west speak other branches of Uralic. This implies a western source for Uralic that was predominately EHG with some older Eastern components, which later mixed with newer immigrant tribes (Nganasan-like) who adopted their language and expanded further during the Iron Age after being enriched with eastern ancestry. If EHG was the Proto-Uralic population, then how do you explain the almost total lack of EHG Y-haplogroups in Uralics, like basal R1a, R1b and J? And the prescence of N clades, which weren't present in EHG. EHG as whole was very likely parent to more languages than merely Uralic. In the EHG northeastern zone, where J-carriers never reached to any significant degree, would be where Proto-Uralic develops. It is also here where R1a predominates, in particular during the Mesolithic (Karelia). As the Neolithic approached the Pit–Comb Ware culture enters into the landscape from the east, where Paleosiberian speaking (and N carrying) tribes are expanding from their ancient home in Northeast China (Xinglongwa culture). These migrants would be relatively small tribes far from their ancestral lands and would naturally begin to adopt the culture and language of the more numerous EHG groups surrounding them without having to thoroughly mix with them. Except in the case of the Uralic speaking Selkups and Khanty, since a small amount of R1a came into them. Later, Iron Age cultural innovations from the eastern steppe began to invigorate the N-carrying branch of Uralic speakers to carve a bigger settlement for themselves (Saami and Ugric expansions) and carry on the Uralic mantle lost by most EHG descendants. Eventually the western groups took hold again, so the N-carriers were relegated to the less hospitable areas (Samoyeds). In recent times, these remote isolated tribes are being erroneously equated with the progenitors of Uralic. Despite the language itself having once had a more extended presence into areas that would later become Germanic and Baltic. There's one each of basal R1a and J in the EHG from Karelia. But these markers are extremely rare in modern Uralics. Practically all of their R1a is the same as in Sredny Stog on the steppe and Corded Ware, which is R1a-M417. In fact, most of the R1a in Uralics is the Balto-Slavic subclade of R1a-M417, which is R1a-Z280. Linguistically it is a long term consensus that Proto-Uralic already had absorbed many IE words. So, it was Pre-Uralic X plus some IE (Yamna, CW) like adstrate at their point of origin. All branches of FU (not that sure of Uralic stage itself due to discussion re Samoyeds) share proto-Indo-Iranian loanwords that mostly are dated to proto-FU stage. I can’t believe this happened without at least some adstrate Sintashta genes. Later West Uralic (Finnic) would absorb lot of words of Balto-Slavic, later North Baltic origin; plus almost at same stage or bit later a lot of words of pre-Germanic, then proto-Germanic, then North Germanic origin. These Baltic and Germanic layers would not be present at very Eastern Uralic speakers, but IndoIranian would. That is from current understanding re IE loans to Uralic, at least via my own prism of whatever I have read what made sense to me. Where are we at with Uralic ? Linguists sometimes choose a western origin. Is the Siberian admixture seen in FUs from a single source, or various different ones ? Where are we at with Uralic? Linguists sometimes choose a western origin. How western and which linguists? The academic consensus is that the Proto-Uralic homeland was somewhere around the southern Urals. I don't know about the Germanic thing. It's always been obvious Saami's non-Asian side has the most European HG and least Anatolian farmer. ANE-admixed, EHG-admixed North Asians can explain the excess ANE signal we've always seen in Saami. But an Iron age Scandinavian pop can't explain all of the WHG in Saami. More or less I guess the recent hunter gatherers who roamed Fennoscandia, unlike the ones in the Baltic states, left almost no genetic trace because Saami's extra ANE can mostly explained by Uralic migration. This reminds me of how recent hunter gatherers of the Asian Steppe also "disappeared." I'm pretty sure that the 0.241±0.092 of Bolshoy_Oleni_Ostrov-related admix in Levanluhta_IA explains its high/low HG/EEF ratios. Obviously, Bolshoy_Oleni_Ostrov is not all Siberian, and in my model not necessarily Uralic either. So, in practical terms you're saying that BOO006 represent the people who spoke Pre Proto Saami, a West Uralic language like Baltic Finnic. Would you say that BOO006 also represents the whole West Uralic speech community or connect just some building parts of BOO006 to West Uralic speakers? The model with BOO006 relies on the assumption that there were whole populations like this female in Europe during the Bronze Age, and the more typical Bolshoy_Oleni_Ostrov samples don't represent anything. Sort of hard to believe. By ''west'', I meant west of the Urals, in the Russian forests. Linguists such as Haakinen amongst them. Do we agree there are multiple sources of ''Siberian'' type ancestry in Uralics, over time ? If so, then something like Leron's scenario seems possible & nuanced. Not necessarily because the tarand Estonians are not genetic Volosovo transplants. Dyakovo and Textile ceramics probably have higher CWC than Volosovo or the eastern Comb Ceramic horizon though. Do we agree there are multiple sources of ''Siberian'' type ancestry in Uralics, over time? Sure, if Bolshoy_Oleni_Ostrov and related groups didn't speak languages from now dead, early Uralic language families. They may have. Not sure where you got the nuanced part? Leron's theory in large part hinges on the R1a in Uralics being from EHG from what is now Karelia and surrounds. This is obviously impossible, since 99% of the R1a in Uralics is derived from Indo-Europeans, and only distantly related to the R1a(xM417) in the northern EHG. So once we take this away, Leron's theory relies on EHG admixture in Uralics, which isn't exactly a specific signal, and linguistics. @ Shaikorth: looks very good, IMO. if you believe CWC was Uralic and keep in mind we have found Ugric N1c in Sargat kurgans and N1c in Tarand grave, the only Uralic cultures mentioned that have been actually tested. What do you think about WSHG or related being a Proto-Uralic marker? Obviously it is missing the Nganassan component but it seems high among Uralic speakers and Neolithic West Siberia is the right place and time. The link between the Ymmyakhtakh culture and BOO suggests they may have spoken a language related to Yukaghir. Similarly, Nganasans may be Uralicized Yukaghirs. The Sikora 2018 supplement discusses the links between Uralic and Yukaghir. The time depth is probably too great to ever be sure of a direct relationship, but there is evidence of contact between the two languages. Isn’t Leron’s theory based on the outdated idea Uralics were Mesolithic Northern Europeans? What do you think about WSHG or related being a Proto-Uralic marker? It doesn't appear to me that the expansions of Uralic languages and N1c were accompanied by a spread of the WSHG genetic component. But I might take a closer look at that. I see Early EHG with basal R1a as an indicator for a population that spoke a proto language ("Eurasian") that existed prior to IE, Uralic, and perhaps others, splitting off from it. This early stage is detected linguistically by correspondence between Uralic and IE that exclude later innovations from IE daughter languages. The proto-IE and proto-Uralic branches diverged into different areas, although not that far apart geographically. After the IE-Uralic split but before the expansion of IE languages is when an eastern foreign people (ydna N/progenitors of Pit Comb Ware), came to interact and shift languages to proto-Uralic. Their eastern ancestral languages are possibly hidden in the substrate of Pre-Finno-Ugric and Saami. The substrate is sometimes assumed to be "Old European" but not found in Germanic or Baltic. However, other linguists propose the substrate being connected to Mongol-Tungusic languages. In addition, Samoyedic is found to have a Far East Paleosiberian substrate. This subject is discussed mostly in Russian, so it's not easily accessible to English readers. The IE line diversifies with Caucasian people in contrast to the Proto-Uralic one. When IE speakers expand north they replace the Proto-Uralic tongue of people in proximity to them (explaining the Uralic substrate) and enrich the region with their own R1a lineages over the older ones. The people further away from them keep the Uralic language but are influenced linguistically by various branches of IE. By my estimation CWC people were not speaking Uralic, but instead primarily had a language closer to IE or even IE itself. Interestingly modern Yakuts do not belong to N-L1026 like BOO but are instead N-M2019. Nganassans are thought to be Paleo-Siberians who were assimalated by Samoyeds migrating north. Karafet 2018 mentions the theory and concurs re:Nganasans and to a lesser degree Nenets. Low L1026 there is also an indicator. For its part, Glazkova doesn't have it either, they're mainly Q with one N1c which is autosomally the most western of them. However that N1c is B187 according to Russian Molgen, present in Okunevo and some modern Siberian Turkics but not in Uralic speakers. CWC was the Indo-European culture and spoke the Indo-European language by definition because this is the only certain linguistic, genetic and archeological link between Europe and India. All the rest like PIE reconstruction and origin is BS speculation, it is like the language of Neanderthals, we will never know anything certain about it. CWC language is certain and it is IE by definition because we have related R1a in Eastern European CWC and in India and thousands almost identical words (which do not require reconstruction) in Indo-Iranian and Balto-Slavic languages. I just don’t understand how anybody who knows anything about languages and genetics can doubt it. 1. But again damn near all R1a in modern Uralic populations is of Indo-European origin, be it Indo-Iranian, Balto-Slavic, Germanic or CWC. Even more northern Uralic populations tend to derive most of their R1a from Indo-Europeans and who knows what’s the source for some of the more basal R1a clades. So I highly doubt R1a had anything significant to do with Uralics. 2. Related to the last point, CWC was indeed Indo-European and the source of Balto-Slavic, possibly Indo-Iranian too and surely an eastern IE or even Balto-Slavic-related substrate in Germanic. From the Abstract: "We investigated the history of this strain by combining phylogenetic and molecular clock analyses of the bacterial genome, detailed archaeological information, and genomic analyses from infected individuals and hundreds of ancient human samples across Eurasia. These analyses revealed that multiple and independent lineages of Y. pestis branched and expanded across Eurasia during the Neolithic decline, spreading most likely through early trade networks rather than massive human migrations." "Geographic distribution of the use of animal traction and wheeled transport across Neolithic and Bronze Age populations in Eurasia, which broadly expanded during the period of 5,500 and 5,000 BP. The expansion of these technological innovations overlaps the predicted period for the expansion of the basal Y. pestis strains." I think we just need to be more flexible with attributing all these R1a lineages as strictly IE. Due to only certain languages having survived, absence of written records and limited ancient genetic sampling, it's easy to overlook the diversity of languages that must have existed before even proto-IE. I'm done with the thread on Uralic. I will wait until newer studies get released to get more insight. I think we just need to be more flexible with attributing all these R1a lineages as strictly IE. All of the modern R1a lineages under M417 are strictly IE (and that's 99% of the R1a in the world today), because there are certain subclades that peak in specific Indo-European language families and both Turkic and Uralic populations carry younger subsets of these lineages. There are no Uralic-specific R1a lineages that reach significant frequencies anywhere today. You need to have a close look at the R1a in Corded Ware and how it relates to the subclades now found in Balts, Germanics, Slavs and Indo-Iranians. Unless you do that, you can't keep pushing your R1a = Proto-Uralic theory, because that's just sloppy and ignorant. Something looks very weird with that admixture graph. Paniya are more Steppe than Iran Neolithic? Suspect. Wonder when the data and new samples of the Dzudzuana and Yana papers (and other recent ones, such as the Anatolian HG and amerindian ones) are going to be released. It would be interesting to model with all this year's new samples. And as for your charge that the comments at this blog are nothing but a so called echo chamber, you and the other banned commentators of your ilk obviously don't understand that to make a real contribution and an impact here you must offer coherent arguments based on accurate interpretations of data, not some fantasies pulled out of thin air. All the best in one day understanding what I just said. Paniya are more Steppe than Iran Neolithic? Suspect. The Paniya may or may not have some steppe ancestry, or at least steppe-related ancestry, like perhaps from Central Asian foragers such as the Kelteminar people. But Iran Neolithic certainly has zero steppe ancestry. So is R1a-M417 Uralic, Indo-European or both? Can’t see them being both. Do R1a English people or Scandinavians derive from Uralics? Are Uralics from the Chalcolithic and R1a-M417 is from a pure EHG population that mixed with CHG at the same time to form Indo-European? Your whole argument sounds like a mess. But who am I to judge, when the data speaks for itself: R1a and steppe ancestry go hand-in-hand in almost all ancient DNA samples. He has his own blog now, but obviously feels the need to pop in here for old times' sake, or something. Maybe Shamanka, Lokomotiv will do will to explain at least part of the Siberian signals in Uralics ? Glazkovo_EBA is another name for Shamanka_EBA. But I'm just using it as a proxy for the main East Eurasian signal in Levanluhta_IA and thus Saami. I don't actually believe that the Proto-Uralics, or even Pre-Proto-Uralics, came from near Lake Baikal. It seems to me that at some point, probably during the Bronze Age, this Glazkovo_EBA-like ancestry became widespread all the way from far Northeastern Europe to East Asia, and somehow it became a feature of the N1c-rich Proto-Uralics before their main early expansions. Some Corded Ware individuals belong to R1a-L664, which is xZ283. And Sintashta is mostly R1a-Z93, which is also xZ283. So the Corded Ware paternal marker is R1a-M417 not R1a-Z283. And like I said, practically all Uralic R1a is very young and obviously derived from extant Indo-European linguistic groups, mostly Balts and Slavs. Some of it might be from Srubnaya. So it ain't from any start of the IE/Uralic split or end of such a split. It's from the Middle Bronze Age onwards, and even mostly the historic period. The northeastern R1a1* lineages that spoke the language that sourced Uralic would have been replaced by immigrants carrying N. As I said previously about Uralic: language moved west to east, genes moved east to west. All these would be small tribes that did hunting and fishing and were bound to be erased by more vigorous populations coming one after another. Hence there's almost no survivals in present times of the older lines while the "young" ones were more successful. I consider CWC to be speakers of a sister language to IE (Centum IE substrate). 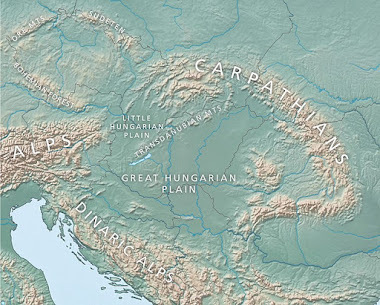 Indo-European would developed from the contact zone between Cucuteni–Trypillia and western steppe groups, that infused Caucasian-like culture/language elements to Proto-IE and allowed them to dominate a big part of the continent. The northeastern R1a1* lineages that spoke the language that sourced Uralic would have been replaced by immigrants carrying N.
And where, in your estimation, does CWC come from? Because R1a-M417 comes exactly from the contact zone between Cucuteni–Trypillia and western steppe groups. So are you saying CWC just happens to be almost 100% R1a-M417 by coincidence? Never mind, I'm not interested. You're not making any sense. Sounds like you’re trying to reconcile the genetic evidence, the Indo-Uralic hypothesis and the Uralic = Paleo-European theory with each other, but okay. "It seems to me that at some point, probably during the Bronze Age, this Glazkovo_EBA-like ancestry became widespread all the way from far Northeastern Europe to East Asia, and somehow it became a feature of the N1c-rich Proto-Uralics before their main early expansions." Glazkovo_EBA or anything close to that is apparently way too eastern, if you're willing to connect that to Proto Uralic stage. Besides, based on that what we already know, there's no way to derive European N1c1 clades, such as those of Finns (and ancient Hungarians etc.) from BA Baikal. Either way, in the next couple of months we'll know more. I never claimed that the Glazkovo_EBA-like ancestry was from near Lake Baikal. I said that it probably wasn't. From Baikal or not, Glazkova_EBA like ancestry is according to my understanding related to parallel or secondary expansions vs. Proto Uralic. But, as said, some time next year we should know more. Well, BOO006 has a lot of Glazkovo_EBA-like ancestry. Yes, related to a parallel expansion from Taymyr and/or Yakutia. Again and based on that what we already know, there's no way you can connect Proto Uralic, from linguistic point of view, to those places. I'd however say that Proto Uralic speakers were possibly still sort of Siberians i.e. West Siberians, most probably based on some kind of a WSHG/EHG heavy mixture with a little bit neolithic farmer. Just like Shaik's model was implying. I'm not seeing a huge signal of WSHG in Levanluhta_IA when Bolshoy and Glazkovo_EBA are there, and then if given a choice the algorithm mostly picks Glazkovo_EBA, and gets a significantly better fit with it. Do you have any ideas how I can model Levanluhta_IA with significant WSHG? Should I try leaving out Bolshoy? But why would I do that? @ D: Relevant samples not being currently available, I think the combined amount of WSHG, naturally including that of BOO samples, is crucial. As Shaik said, BOO seems to be a mixture in process, including a West Siberian element, i.e. WSHG (and N1c1). If there is one female sample in Bolshoy that is more eastern than the others and takes more Glazkovo than the others, we could indeed imagine that this female belongs to an other population on a more northern route and the yDNA of this population would be the same as we have in Glazkovo, i.e. Q1b1b1-YP4004 (Q-L53). In this model, Bolshoy N1c would represent the West Siberian part of the Bolshoy ancestry which would also contain some Baikal ancestry. Or N-P43 instead of Q-L53. Considering it is down stream from the N-L666 found in BHGs and common in modern Samoyedic speakers. Some people seem to be confused but modern testing and the little aDNA we have points to L1026 being born west of the Urals not in Yakutia. Can Estonians be modeled with Glazkovo? Maybe use Baltic BA. Latvians may be eating up some Eastern stuff. They are, but it's harder to model Estonians as Baltic_BA, because they have a bit of extra admix from different directions, including probably east, west and south. So using Latvians was quick and easy. According to some models I've seen in the Finnish forum the amount of WSHG in BOO samples is quite sizeable (and there really is WSHG in BOO, as confirmed by Narasimhan). Roughly one fourth (N1c-man), one third (the woman with Iranic type of lineage) and even the most eastern sample i.e the woman coded as BOO006 is rather WSHG, one fourth part of the whole genebase. Then there's EHG, on top of that. Taking BHG (probably coming from Taymyr/Yakutia) away from the samples, i.e. by doing that creating a hypotethic West Uralic zombie, would naturally considerably increase the level of both WSHG and EHG in the samples. Speculation, of course, but then again: the new IA sample of Finnish Tavastia (not published yet) is heavily biased towards Eastern European/Scandinavian HG's and apparently the amount of BHG is minimal, if it even exists. P.S. BOO006: roughly one fifth part, not fourth. My apologies. @ D: not willing to get involved into lengthy discussions concerning right method, relevant outpops etc., I'd however say that even 4- 6 % of WSHG in BOO is enough, for the sake of argument. By excluding Nganasan you will anyways, just by relying on your own model, end up having lots of EHG and yet quite a lot of WSHG in BOO. So, in practical terms we anyways end up discussing the right amount of BHG in Proto/West Uralic speakers, before BOO took place. My question is: if there was BHG, why it is not clearly visible in Estonian Tarands or in the new Finnish IA sample? Where did it go? Disclaimer: I'm deeply convinced that at least Pre Proto Uralic speakers were Siberians, but West and definitely not East Siberians. Excluding Nganasan doesn't work. You can see that in the full output that I posted. It results in failed models. So I'm still not seeing any significant WSHG in BOO. My question is: if there was BHG, why it is not clearly visible in Estonian Tarands or in the new Finnish IA sample? Where did it go? On a related note, did you notice that in my model BOO is modeled as part Baltic_IA which belongs to N1c, and in the Lamnidis et al. models BOO requires significant EEF? @ D: obviously you can't exclude Nganasan if you're looking at BOO, which is an outcome of a BHG related admixture event. What I meant was that by excluding Nganasan i.e. taking it off the model outcome, you'll get a hypotetical Proto/West Uralic speaker, kind of Proto/West Uralic Zombie, if you like. Baltic_IA shouldn't be too far off, when we're discussing Proto Baltic Finns, still I'd guess it is too Baltic (too much WHG, too much EEF). That being said, I'd guess that this hypotethical Proto/West Uralic Zombie does need some EEF, not just WSHG/EHG. What could be this source of N1c then, in regards to that Baltic_IA-like population? Seems to me like N1c was introduced into BOO from the south, not from the east. Yeah that’s why I asked. What population could have given this Baltic_IA-like population their N1c? Also that’s a kinda radical shift in evidence... but maybe it simplifies the question of N1c in Balts a bit? N1c obviously orginally came from the east. BOO is just too late to represent the original N1c expansion west of the urals and doesn't make sense for the wave that brought it to Finland. Imo N1c into Baltic_IA goes Volosovo-Netted Ware- Tarand graves or other related post Netted Ware cultures- Baltic_IA. Basically whatever PU looked like plus CWC/European HG as they moved west. But I wonder, in addition to what kind of Siberian ancestry they have, if any archaeological culture could be linked to it and their N1c. Though it’s definítely interesting BOO likely got their N1c from a mostly CWC-derived population. Though it’s definitely interesting BOO likely got their N1c from a mostly CWC-derived population. This is rather unlikely. More likely is that a population similar to Baltic_IA, but with a much higher ratio of EHG, spread N1c to the west and north from somewhere just west of the Urals around 1700 BC. Otherwise we're looking at an almost total population replacement by such migrants in the East Baltic from the Bronze Age to the Iron Age, which doesn't make any sense. @ Them meee and re:"What population could have given this Baltic_IA-like population their N1c?" This is a good question. I'd guess that migrating N1c's were different from the local population in the same way as Baltic_IA is different from populations of the preceding periods, especially compared to local CW. Re Baltic_IA I recall in anthrogenica forums I asked Shai if it could be modeled using Baltic_BA Kivutkalns to find out the ‘non local component of it’, but I think it was difficult (due to low coverage?) to do so. Instead it preferred modern Latvians, which is a bit strange. And it was like 95% Latvian + EHGish something. Baltic_IA is basically the same as Baltic_BA, but this doesn't mean that there was no population movement into the East Baltic at this time bringing N1c. There probably was, and much of the ancestry of Baltic_IA might not be local, it just looks local. Taking into account the N1c in Baltic_IA and BOO, the most parsimonious scenario is that there was an EHG-rich population somewhere in between them that received N1c from the east and expanded both west and north, taking Uralic languages with it. So it's possible that BOO was partly of Uralic stock. @ D: agreed, makes a lot of sense. However, I wouldn't forget about WSHG yet, pls remember Shaik's Khanty/Mansi minus Evenki model. Both Khanty and Mansi are Uralic speakers too. And, who knows, maybe Narasimhan is not as hopeless as you seem to think? People have their bright moments. Those Proto-Finns who arrived into Baltics would do that via former Fatyanovo (CW) territory, and it is often said in archeological literature that Fatyanovo served as significant substrate for later Finnic cultures. So, CW Fatyanovo substrate (possibly very similar to Baltic BA, perhaps more EHG shifted) for incoming N population is very expected. That Fatyanovo impact would be post-proto-Uralic however, but pre-proto-Finnic. On other hand I expect some CW substrate for proto-Uralic as well. Every Uralic language contains archaic PII loanwords, at least that used to be consensus, dunno if that has changed. I was giving you archealogical cultures that are likely responsible for N1c in Baltic_IA. Netted Ware related cultures froming along Volga and then migrating west into the Baltic. (D'yakovo-Tarand graves, Akozino-Akhmylovo, etc). Probably responsible for different branches N-Z1936 and N-VL29 for example did not separate in Finland or the Baltic but are both found there today. I don't think Baltic_IA carries any more Siberian then a modern Lithuanian but if it does it could be explained by a lot of things. Proto-Uralic, CCC, north to south migrations from post-BOO Finland which explains modern Estonians and probably many more scenarios. Mouthful: "Baltic_IA sample is dated to 2nd-5th centuries, so I'd hold your horses on him being Finnic." Davidski: "I have no idea what language he spoke, especially since he was dug up in Lithuania. He may have spoken some early dialect of Balto-Slavic." AFAIK Baltic_IA sample DA171 is dated to 350-650 AD. There can be very very little doubt that he spoke a variety of Baltic. At such a late date, right in the middle of the historical Baltic area, and with an ultra-Baltic position in the PCA. But yeah, as Davidski said, it's not the point indeed. Oops, yeah the date for Baltic_IA DA171 is BP not BC. But this doesn't affect my blog post.